It Always Seems Impossible Until It’s Done! – Motivational Mantras!! 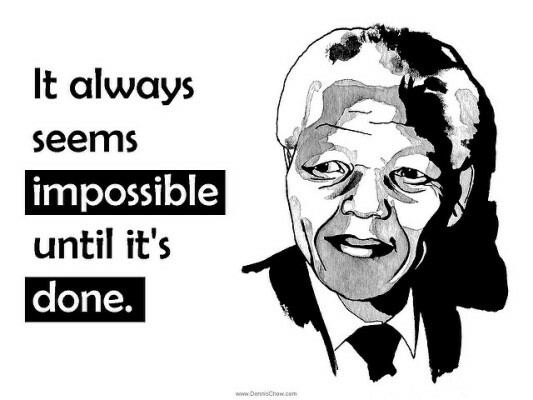 Nelson Mandela, a renowned name in the world quoted that “It always seems impossible until it’s done.” This is by far the most spectacular truth of the universe which itself says that everything is possible in this world. Let’s just once try to think of the times when the evolution of the world took place, and now immediately think of the world today! Did people in ancient times ever think that man will reach to moon? Did they ever think that man will reach in space? Did they ever think the development will reach to such a great extent? I guess no. But then, again there were these people of the ancient times only who have initiated the chain of development, science, experimentation etc that we are carrying even today and improving it day by day. The reason being, nothing is impossible but it always seems impossible until it’s done. If you dream of your life at stars, you can actually make your life up to it and trust me: it will be the most adventurous journey you’ll ever have. Dreams add meaning to your life and you can do it, if you can dream about it. All you need is hard work and dedication, till you reach there. Your enthusiasm and persistence should be uttermost and you can achieve any height, no matter how much impossible it seems. Many of the times, we give up on our dreams just because things didn’t take place as we wanted them to occur in our life. But we forget that this life is a lesson and a game indeed, where you never know what will come across your way. But all you can do to overcome each obstacle of your path is “be ready for both the attack and defense at the same time”. Be ready to face every difficulty that comes across your way and the moment you feel your goal impossible, just once think about how far you’ve come to acquire it and how would it feel like if once achieved. Dear people, if it was impossible, then you wouldn’t have given a thought about it, and now that if you did; I feel you’re worth achieving it. Let’s just strategize our moves, build the courage within and make our enthusiasm eternal to live a life of our dreams. Want to live the life of your dreams? IT IS POSSIBLE! Previous Never Leave Your Home Without Confidence! Next The Optimist Sees Opportunity in Every Difficulty!